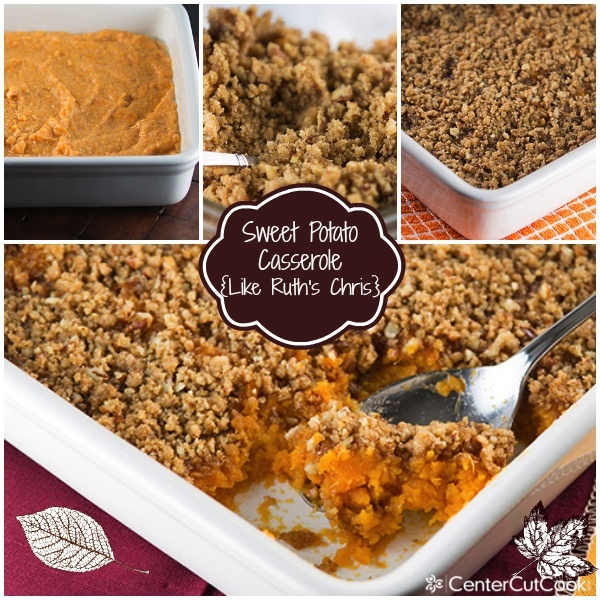 Sweet Potato Casserole like Ruth’s Chris with a pecan crust! Perfect for Thanksgiving and a delicious alternative to the version with marshmallows! 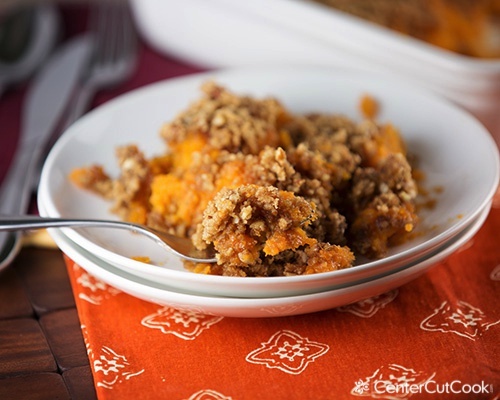 Sweet Potato Casserole seems to be one of those polarizing traditional Thanksgiving sides that people either really love or they hate. My Mom was one of those people that felt as though Thanksgiving dinner was just not complete unless there was sweet potato casserole with marshmallows on top. Toasted marshmallows of course. Forget the mashed potatoes and the stuffing, Thanksgiving to her was all about the sweet potatoes! I on the other hand, never really cared for the popular sweet yet savory side.Over the years I have tried all kinds of variations ranging from the one my Mom made every Thanksgiving with marshmallows, Southern Living’s popular version, and Boston Market’s sweet potato casserole with marshmallows and a streusel topping. No matter who made it, sweet potato casserole was never a “must-have” side to me. My feelings about Sweet Potato Casserole all changed when I went to Ruth’s Chris steakhouse for the first time. What does steak have to do with Sweet Potato Casserole, you ask? Ruth’s Chris happens to have a side on their menu for Sweet Potato Casserole with a Pecan Crust. Now, normally, I am not a huge fan of pecans, but because it was highly recommended to me, I decided to try it. After one bite it was pretty much love at first site! 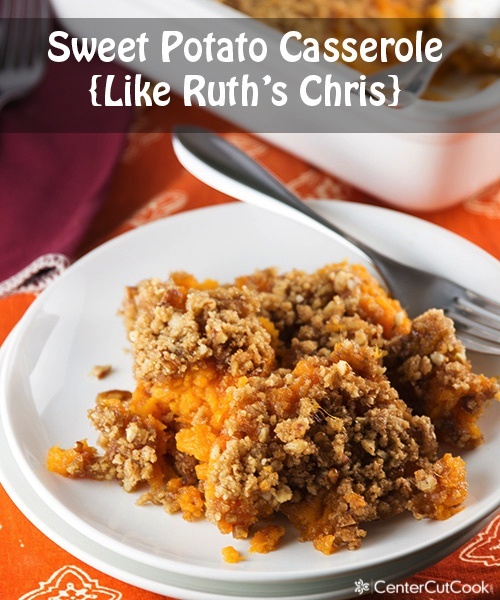 The recipe I’m going to share with you today is very similar to the Sweet Potato Casserole on the menu at Ruth’s Chris. What completely makes this a winner in my book is the pecan crust. In some ways it reminds me of one of my favorite Christmas cookies ever, the Pecan Tassie. Even if you don’t like pecans, please don’t write-off this recipe. The pecans get chopped really finely so that the flavor isn’t too strong. The result is a wonderful savory side-dish that will make you forget that you ever used to like sweet potato pie with marshmallows. Even my sweet potato hating husband liked this! Oven: Heat the oven to 400 degrees. Lightly scrub the potatoes to remove any dirt. Poke potatoes with a fork a few times. Bake for 45-60 minutes, or until the potatoes are fork tender. Allow the potatoes to cool for a bit, then carefully remove the skin, then mash. Microwave: Lightly scrub the potatoes to remove any dirt. Poke the potatoes with a fork a few times. Cook each potato for 8-10 minutes, or until fork tender. Allow the potatoes to cool for a bit, then carefully remove the skin, then mash. Stove: Peel the sweet potatoes and cut potatoes into 1/2 inch cubes. Place the potatoes in a large pot. Cover the potatoes with water, then bring the potatoes to a boil and cook for 12-15 minutes, or until fork tender. Drain the potatoes, then mash. You will get about 8 servings from this recipe. Enjoy! Pre-heat your oven to 350 degrees and prep a medium to small sized casserole dish with cooking spray. I used a 9×9 inch casserole dish. 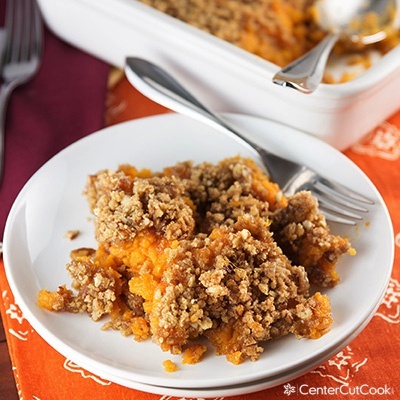 Use a mixer to whip together cooked, mashed sweet potatoes (instructions to cook, bake, or microwave sweet potatoes above), 2/3 cup granulated sugar, 1/4 teaspoon salt, 3/4 teaspoon vanilla extract, 1 egg – beaten, 3 tablespoons unsalted melted butter. Mix until the potatoes are light and fluffy. Pour the potato mixture into the prepared casserole dish and bake for 30 minutes. Meanwhile, combine the crust ingredients in a small bowl – 2/3 cup brown sugar, 3 tablespoons all-purpose flour, 1/2 cup finely chopped pecans, 3 tablespoons melted butter and 1/2 teaspoon vanilla extract. Sprinkle the crust over the casserole after it has baked for 30 minutes. Bake for 10-15 minutes longer, until the pecan crust is lightly browned and crunchy.